Obituary for Patricia Emily Hoot Kresge | Longwood Funeral Home & Cremation of Matthew Genereux, Inc.
Patricia Emily Hoot Kresge, 82, of Chadds Ford, PA, formerly of Stroudsburg, PA, passed away at home on Monday, August 20, 2018, surrounded by her loving family. Born in Bryn Mawr, PA on Nov. 3, 1935, Pat was the second child of Rowland Hoot and Florence (Haven) Hoot. She grew up idyllically with her older brother (by one year) Rowland, spending summers in Avon-by-the-Sea, NJ as a child, and winters at home in Brookline, PA. Pat loved the sea from the start and continued to spend summers in her beloved Cape May, with her dear husband of 61 years, David Batten Kresge, up to the end of her life. Life surely changed for Pat on Christmas Day, 1950 when her mother died. By then there were two additional children, aged six (Charles) and five (Pam). Pat, along with her father and older brother, took on the task of keeping the family focused and together. This was greatly aided by her maternal grandfather, Charles Chauncey Haven, who played a key role in Pat’s life, as he fostered resiliency and quiet loving ways with his family. She would quote CC Haven’s wise advice and witticisms throughout her life. Anyone who knew Pat at any point in time would agree that the loss of her mother became the impetus for Pat being the giving, loving and strong person she was throughout her life. Pat’s motherly advice to others, as Pat wrote in a book given as a gift from Wendy: “Always BE there for them”. Pat graduated from Haverford High School in 1953 and attended East Stroudsburg State Teachers College for two years. Pat then went to secretarial school in Philadelphia, after which she worked for several doctors in the city. At about this time she met and married the love of her life, David Kresge. Pat and Dave lived their early married years in the Toms River, NJ area, moving to Stroudsburg in 1967, when David started teaching at East Stroudsburg State College. They retired to Chadds Ford in 2002, to be close to their daughters and grandchildren. While Pat lived in Stroudsburg, she was an integral part of the community, working in several businesses before becoming the executive director of the American Cancer Society in Monroe County. Using her innate and extensive people skills, she held that position for 17 years. For a portion of those years, Pat took on the directorships of Wayne and Pike Counties as well. During her leadership, Pat spearheaded many campaigns to initiate and support better services for cancer patients in the three county area. Pat received several awards and honors including the creation of the Patricia Hoot Kresge Community Garden, opened in 1999 in Stroudsburg in recognition of her service, the Liberty Bell award from the Monroe County Bar Assoc. and the Rotary Club Award. Whenever Pat received such honors, she humbly gave all the credit to the ACS volunteers. Associates agreed that it was Pat's enthusiasm and commitment to serve that inspired countless others to do the same. In the end, we can rejoice and be exceedingly glad, for great is Pat’s reward in Heaven. Pat nurtured friendships that endured throughout her 82 years and continued to build new relationships right up to the end. 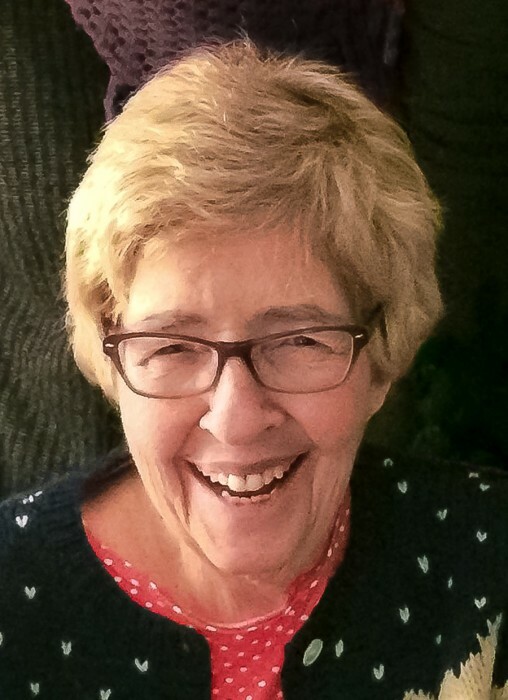 Guided by her love for the Lord, Pat would go out of her way to show kindness and love, and everyone felt included in her open loving arms and warm and welcoming home. Her greatest joy was being with her daughters and their children, to whom she was devoted, past the moon. Pat is survived by her husband of 61 years, David Batten Kresge, her daughters Valerie Haven Kresge, of Bear, DE and Pamela Miles (Martin) Misciagna of Parkesburg, PA. She is also survived by her brother Charles (Sara) Kendall Hoot of Whitefish Bay, WI and sister Pamela (William) Hoot Hoy of Stroudsburg, PA. She was predeceased by her youngest daughter, Wendy Dixon (Kresge) Wick, who passed away in May 2017. Pat’s older brother Rowland Haven Hoot, her sister-in-law, Nancy Richardson Hoot, and her parents, Rowland Mott and Florence Emily (Haven) Hoot went before Pat, and were waiting to welcome her home, as Pat always did while she was here. Pat was also predeceased by her step-mother Mildred Brown Peters Hoot, and step-sisters, Kathryn Eyer Price, Jane Albrecht and Linda Pipher. Left to carry on Pat’s loving legacy are her four grandchildren; David Martin Misciagna and Luke Francis Misciagna of Parkesburg, PA, and Skyler Emily Wick and Josh Settle Wick of Landenberg, PA and son-in-law, Jack Borden Wick, III. Pat also leaves behind many nieces and nephews, great-nieces and great-nephews, all of whom will now spread Pat’s spirit of abundant and unconditional love and joy. A memorial service will be on Saturday, September 8, 2018 at 11:00AM at Lower Brandywine Presbyterian Church, 101 Old Kennett Road, Wilmington, DE. A reception will follow in fellowship hall. If desired, memorial contributions can be made in loving memory of Patricia Kresge to the following: Samaritan’s Purse, Brenda Herhei (one of Pat’s hospice caregivers, who is returning to Hungary as a missionary with Pioneers - 45 Elm Creek Road Cochranville, PA 19330), or to the Multiple Myeloma Research Foundation.